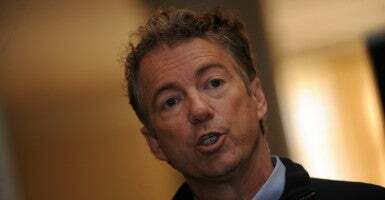 Sen. Rand Paul, R-Ky., outlined the federal government’s decision to fund a multimillion-dollar Philippines disaster preparation project in a new edition of The Waste Report. The Waste Report, released Monday by Paul, chairman of the Subcommittee on Federal Spending Oversight and Emergency Management, “is an ongoing project cataloguing egregious examples of waste within the U.S. government,” according to a press release from Paul’s office. USAID will fund approximately 12 Climate Ready projects, each ranging up to $2 million, according to the press release. Sen. Paul’s report clearly illustrates everything that’s wrong with the grant process. Taxpayer dollars are allocated for a purpose that’s not in America’s direct national interest, and then the project has zero parameters or safeguards built in to prevent public funds from being frivolously wasted on projects that may or may not even accomplish the original goal. Taxpayers’ money should only be spent on critical national priorities and must include several layers of oversight requiring specific details on how and where the money will be used. The report compares the Philippines Climate Ready project to another federally-funded project. A video game created for high school students that “focused on the impact of Florida communities of sea-level rise” was meant to motivate an age group “not particularly motivated to act” on behalf of climate issues. David Kreutzer, a senior research fellow for energy economics and climate change at The Heritage Foundation, told The Daily Signal in an email that because USAID’s proposals are extremely “vague,” it is hard to tell exactly what its Climate Ready project really entails.